...to the only gay guest house/gay B&B located right-on Jomtien beach, also known to locals as Dongtan beach; Pattaya’s exclusive gay beach here in Thailand. 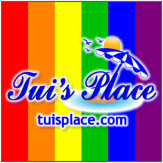 We are Tui’s Place Guest House, Bar & Restaurant and we offer you a unique place to come stay and relax, where you can enjoy our comfortable place on the gay beach. We have some of the cheapest room rates anywhere, especially when considering that the gay beach is less than a 30-second walk to your room. Guests can enjoy using the private swimming pool here too, and as our guest; you are welcome to use this facility to relax during the day, in relative peace and quiet. Come unwind - any time, while savouring our great choice of local and western food; so you can return home refreshed, with nothing but the fondest of memories - courtesy of the warm, genuine hospitality you will receive from the friendly Thai locals here - in Jomtien and Pattaya. ...you are very welcome to come see why so many of our guests return as friends to enjoy the peace and tranquillity that ensues from being the only gay guest house on Pattaya’s gay beach. During the day Tui’s Place can be busy but at night quiet apart from the sound of surf crashing upon the shore. Our part of Jomtien beach; known to locals here as Dongtan beach, stretches- on for 800-meters when turning right at the end of Thap Phraya Road (7/Eleven and Police Station). It is planted with pine and palm trees, which bring lots of welcome shade from the sun. There is cheap, safe and continuous return transportation from our guest house to downtown Pattaya, 24-hours-a-day. Journey time is less than 15-minutes, for a cost of 10 Thai baht. Thank you very much then for visiting our website today. We hope you find what you are looking for and trust you will come visit Tui’s Place in person - one day soon. There are 6-rooms but only 4 of those rooms are prepared each day to accept guests. Current room inventory is: • 3 × Sea view rooms and • 1 × Condotel view room ...available on four floors. Depending on demand and time of year, room rates do vary. Returning guests though always receive discounted rates. Our bar opens at 9 o’clock every morning, to serve our guests both non-alcoholic and alcoholic beverages. 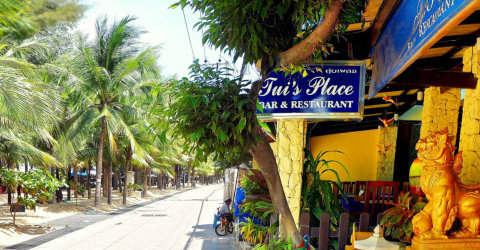 Location aside we have reliable, free high-speed Internet for your use, which means Tui’s Place is one of the coolest places to come “people watch” and enjoy a coffee or a cocktail relaxing with friends, or even with “new friends” you will surely meet, along the gay beach. As you may have guessed - being in Thailand means we have a large choice of sumptuous Thai dishes to prepare and share, cooked fresh for your enjoyment. We have many Western style surprises for your palate too. Food orders are available on the beach as well, so please ask the boys who take care of you there, to give you our menu. ...you are very welcome to come see why so many of our guests return as friends to enjoy the peace and tranquillity that ensues from being the only gay guest house on Pattaya’s gay beach. During the day Tui’s Place can be busy but at night quiet apart from the sound of surf crashing upon the shore. Our part of Jomtien beach; known to locals here as Dongtan beach, stretches-on for 800-meters when turning right at the end of Thap Phraya Road (7/Eleven and Police Station). It is planted with pine and palm trees, which bring lots of welcome shade from the sun. There is cheap, safe and continuous return transportation from our guest house to downtown Pattaya, 24-hours-a-day. Journey time is less than 15- minutes, for a cost of 10 Thai baht. Thank you very much then for visiting our website today. We hope you find what you are looking for and trust you will come visit Tui’s Place in person - one day soon. 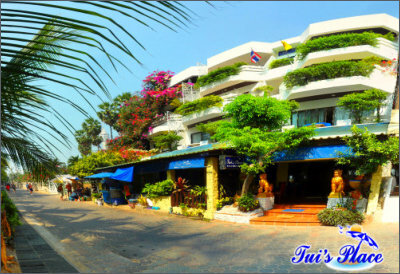 ...to the only gay guest house/gay B&B located right- on Jomtien beach, also known to locals as Dongtan beach; Pattaya’s exclusive gay beach here in Thailand. 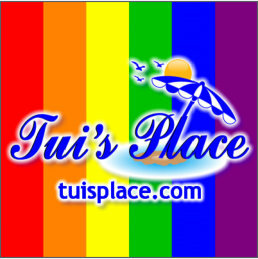 We are Tui’s Place Guest House, Bar & Restaurant and we offer you a unique place to come stay and relax, where you can enjoy our comfortable place on the gay beach. We have some of the cheapest room rates anywhere, especially when considering that the gay beach is less than a 30- second walk to your room. Guests can enjoy using the private swimming pool here too, and as our guest; you are welcome to use this facility to relax during the day, in relative peace and quiet. 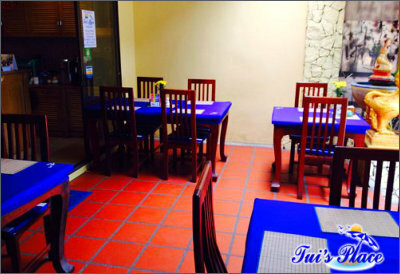 Come unwind - any time, while savouring our great choice of local and western food; so you can return home refreshed, with nothing but the fondest of memories - courtesy of the warm, genuine hospitality you will receive from the friendly Thai locals here - in Jomtien and Pattaya. ...you are very welcome to come see why so many of our guests return as friends to enjoy the peace and tranquillity that ensues from being the only gay guest house on Pattaya’s gay beach. During the day Tui’s Place can be busy but at night quiet apart from the sound of surf crashing upon the shore. Our part of Jomtien beach; known to locals here as Dongtan beach, stretches-on for 800- meters when turning right at the end of Thap Phraya Road (7/Eleven and Police Station). It is planted with pine and palm trees, which bring lots of welcome shade from the sun. There is cheap, safe and continuous return transportation from our guest house to downtown Pattaya, 24-hours-a-day. Journey time is less than 15-minutes, for a cost of 10 Thai baht. Thank you very much then for visiting our website today. 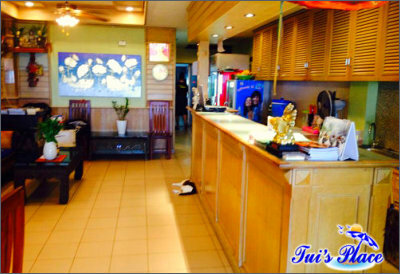 We hope you find what you are looking for and trust you will come visit Tui’s Place in person - one day soon.